Almetek Industries Ltd. - Nomenclature and signage. Barfield Manufacturing Company - Aluminium equipment mounts, Enclosures, meter mounting devices. Broy Engineering Ltd. - Transformer quick testers and hot stick mountable Amp meters. Canadian Connector Corporation - High quality mechanical and compression connectors and above grade multi-tap junction boxes. Cyto-Meridian - CytolokTM spring lock technology lug systems. Dossert Corporation - Substation connectors. GMP - Cable lashers and utility equipment. GORILLA NET- Cargo Restraining covers. GS T&D Products Ltd. - Pursley brand inline, underslung and air brake switches. Hastings Mfg. - Fiberglass hotline tools and lineman's equipment. J.E.Lortie Company - Jelco brand safety equipment including the Pole Choker IV pole climbing system. Klein Tools - Hand tools and personal safety equipment for linemen. Little Mule Hoists - Complete line of hoists including lineman's strap and chain hoists. Plymouth Bishop Company - Vinyl and rubber insulating tapes and silicone cold shrink terminators. R&M Plastics Company - PVC cable and guy guards, ground wire moulding, spiral wrap cable markers. Raychem/RPG- Stainless Steel banding and accessories. Sherman & Reilly Inc. - Overhead and underground pulling and cable handling equipment. Synertech Moulded Products Ltd. - Polymer concrete below grade, load bearing junction boxes. Timberland Manufacturing Ltd. - Overhead and underground puling and cable handling equipment. 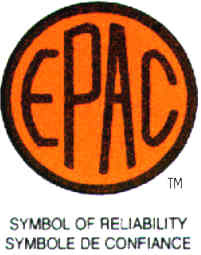 Allow EPAC the opportunity to quote and supply all your pole line hardware and utility equipment requirements.